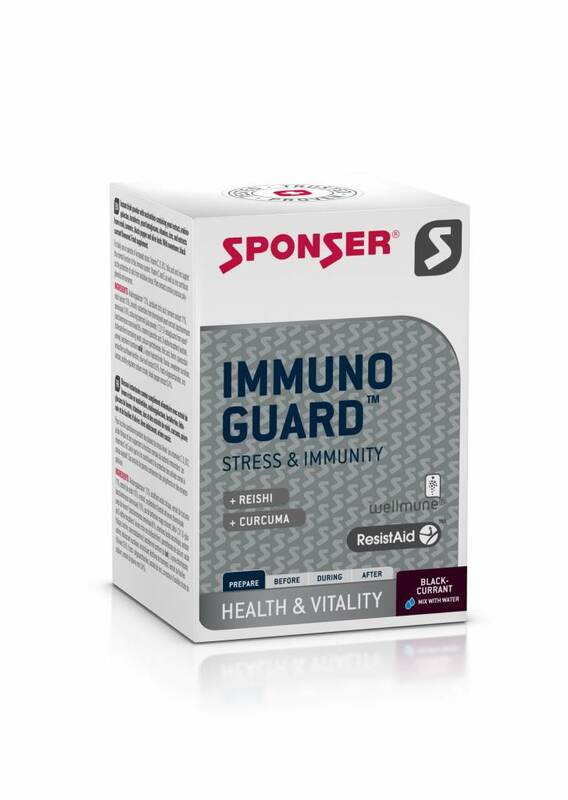 IMMUNOGUARD® by SPONSER is a natural vegetal dietary supplement scientifically developed to stimulate the immune defenses and protect against oxidative stress. 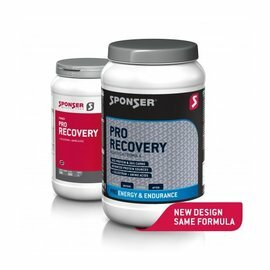 This product was designed for athletes, but due to its high-quality functional ingredients, it is also suitable for everyday use, at work or during periods of increased stress. It can be taken preventively or in acute situations. Nucleotides are the primary building blocks of cell replication (RNA and DAN). Whenever cells need to be re-formed, such as in the formation of white blood cells during an immune response, nucleotides play a central role. ResistAid® Arabinogalactans are soluble dietary fibres, which have antioxidative properties as they contain polyphenols. Arabinogalactans boost the immune response by increasing the activity of natural killer cells, cytokines and macrophages. 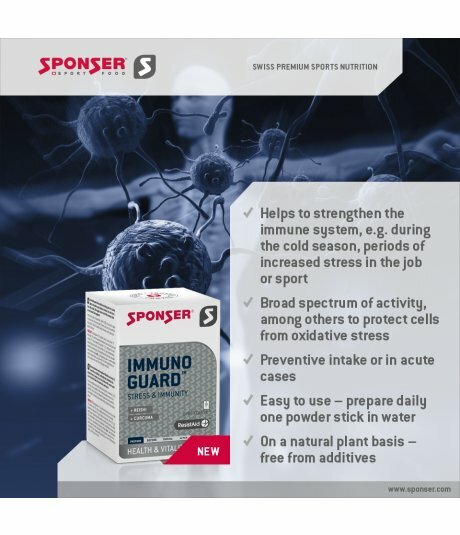 Due to the increased immunocompetence of the body, viruses and bacterial stressors can be better inactivated. Part of the Far Eastern diet since centuries. Turmeric is considered anti-inflammatory and anti-microbial. Reishi is a nutritional mushroom with anti-inflammatory properties. It is also used in the Far Eastern diet since thousands of years. The mechanism of action is based on bioactive polysaccharides, which, in a similar way to arabinogalactans or beta-glucans, attach to viral or bacterial stressors and inactivate them. Olive leaves are rich in hydroxytyrosol. A substance of the large polyphenol family with strong antioxidant properties. Beta-glucans are polysaccharides and occur naturally in yeast and cereals. Yeast beta-glucans have a slightly different chemical structure than the cereals variant. The elongated 1.3/1.6 carbon branches allow granulocytes to attach to bacterial and viral stressor, allowing the immune response of the body. 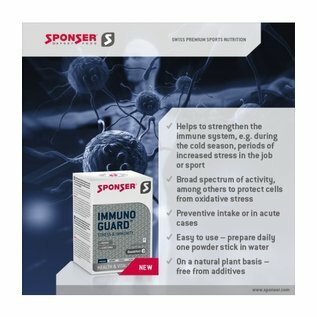 A study on athletes showed that professionals with a daily intake of 250 mg yeast beta-glucans suffered significantly less from respiratory infections, compared to a placebo. In addition, it showed a dose-dependant system of action, i.e. the larger the amount of beta-glucans extract, the lower the susceptibility to infection. Black pepper contains piperine, which is responsible for the spiciness. But for us human, piperine is not only of interest as a sensory molecule. In the context of immune defence, piperine has an antimicrobial effect. Also, piperine appears to enhance the assimilation of other nutrients, such as curcumin, which is the reason why piperine is used in dietary supplements. Lactoferrin is a proteinaceous iron compound that not only promotes iron absorption, but also has immunoprotective properties. Lactoferrin forms complexes with iron containing pathogens, rendering them harmless. 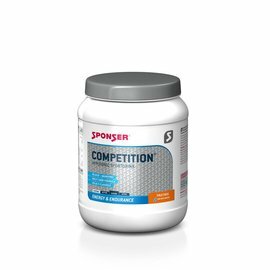 Vitamins C, D, B12, folic acid and zinc support the normal functioning of the immune system. Vitamins C and E as well as zinc help to protect cells from oxidative stress. Folic acid and vitamin B12 in particular play a role in the process of cell division. Plant extracts contain valuable health promoting polyphenols and enzymes.